Discussion in 'Amps and Cabs' started by Yossi, Mar 20, 2008. 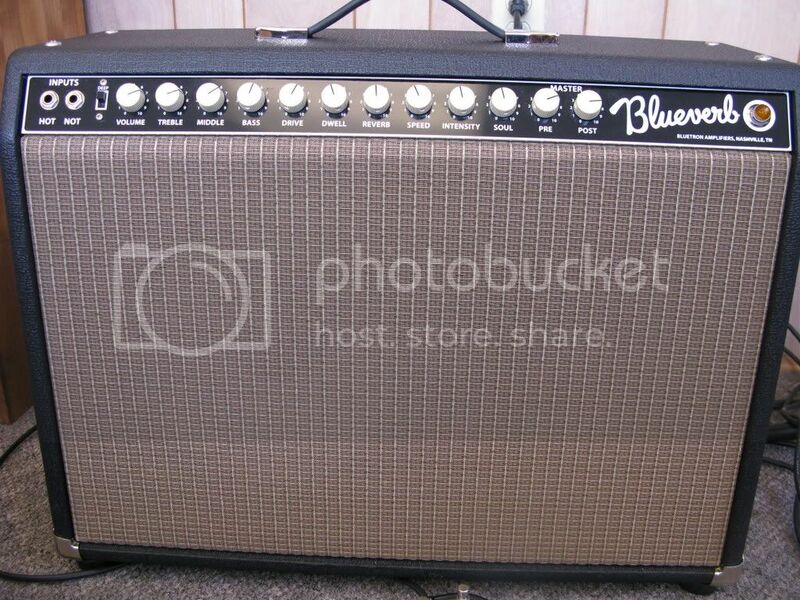 I would like to start a thread about my newest amp: The Bluetron Blueverb. First let me tell you an anecdote. I was playing at work during my lunch break yesterday when one of our workers, who plays guitar in a band, came into the conference room to ask me a question. I was playing my LP Classic with WCR GWds/Drkbrst P'ups plugged into an OCD distortion pedal then into the amp. He was floored with how good the amp sounded. I demoed the amp w/without the OCD, it didn't matter, he was astonished at the tone. He told me that it was the nicest sounding amp that he has ever heard. He told another guitarist that it sounded so good that words can't describe. That made me feel very good and it should make Smitty at Bluetron, feel very good too. 2 x 10, EL-34's, super overdrive voicing, amazing build quality, tons of flexibility, thick, thick, thick with a Lester. Weighs a freakin' ton. Fendery, sparkly cleans when I want em and Marshall grit when I want it. Mine has a VERY focused, tight bottom end so at my last gig, I teamed it up with a Carr Slant 6V to provide some low end "whoomph" and the combination was just about perfect. Got SRV? I just don't have the patience for Smitty's normal process, but PLEASE let me know if anyone has one for sale, especially in a Super-Clone configuration. You, sir, are a very sadistic person. ... especially in a Super-Clone configuration. What's the super clone config? I have heard allot of great things about these amps. I gotta get me one soon. 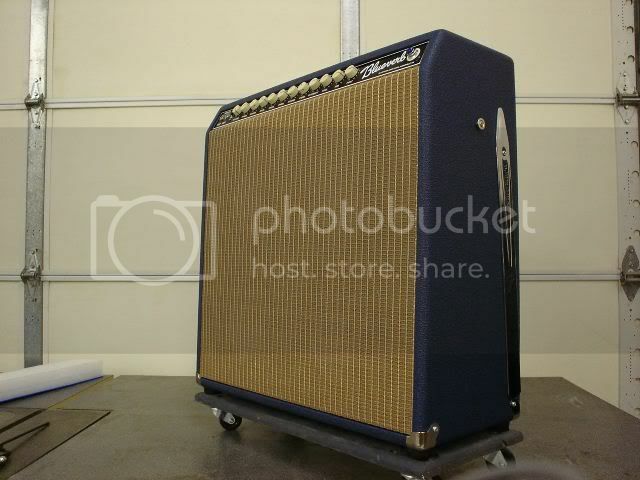 By "Super-clone", I met an amp that woul be based on a Fender Super (and I think that's one of Smitty's transformer options); its more something I imagine that any specific model that Smitty builds. After submitting my deposit in July, I got the call from Smitty in Feb, and received a 1x12 combo with Standard voicing to try the last week of Feb. 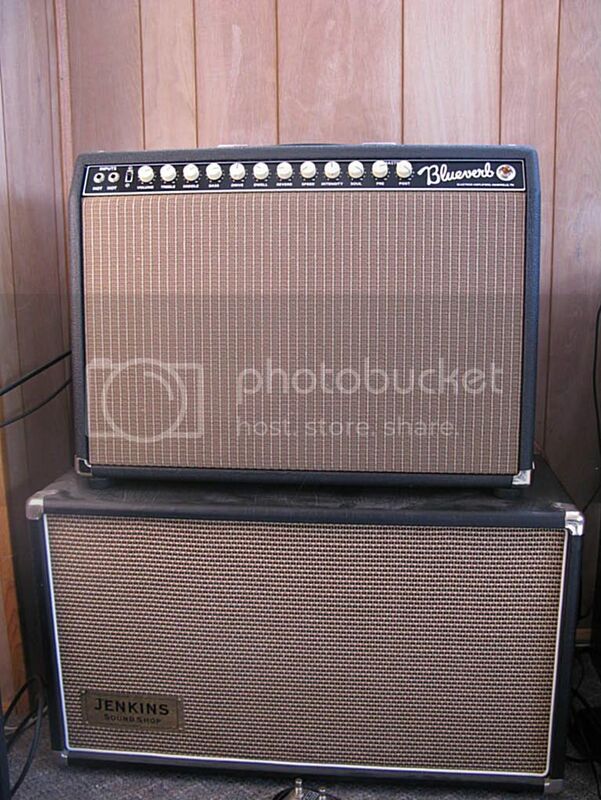 I did A/B comparisons with my '68 Twin Reverb and my '66 Princeton Reverb. The Blueverb was definitely better. I decided to go with a variety of the Clean version. I got an email at lunch today from Smitty. He said it was being burned in and sounded great. Hopefully I will get to start making music with it soon. As stated, mine is the clean voicing with 6V6s, and the 12DW7 in the first position. 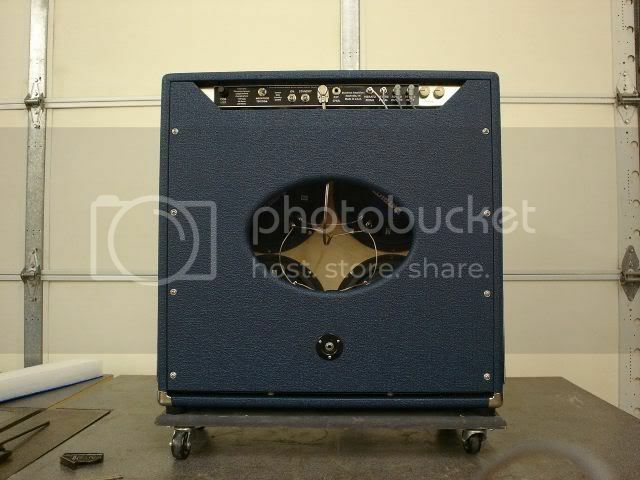 It's the head version; my 1x12 ported cab will ship later. 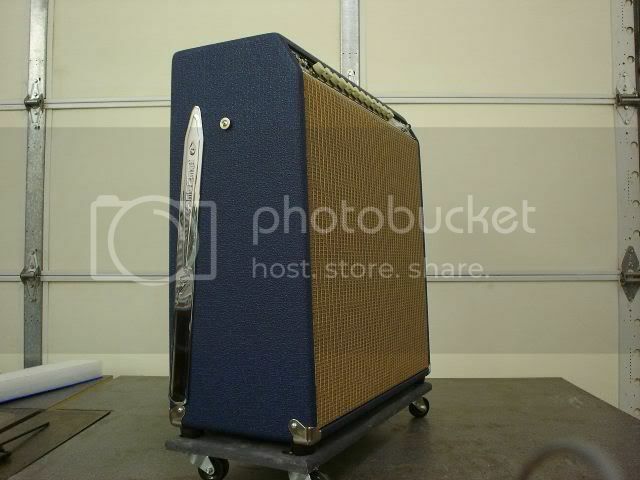 Both will have blue tolex and gold sparkle grill cloth. Oh I see - Smitty now offers a 'tone clone' opton which I guess is even more custom than his 5 other voicings. I doubt it will be anything less than stellar. I am not easlily pleased with generic Fender want-to-be blackface clones. I have had many tweed, brownface, blackface and silverface Fenders. My most favorite (I like many of these flavors) has been a blackface Pro Reverb. To give you an idea of how good that amp sounds, I did an A/B with it against a Bruno Cowtipper 45 with the NOS option, and that particular Pro Reverb was better. But the Blueverb I tried was the best so far. 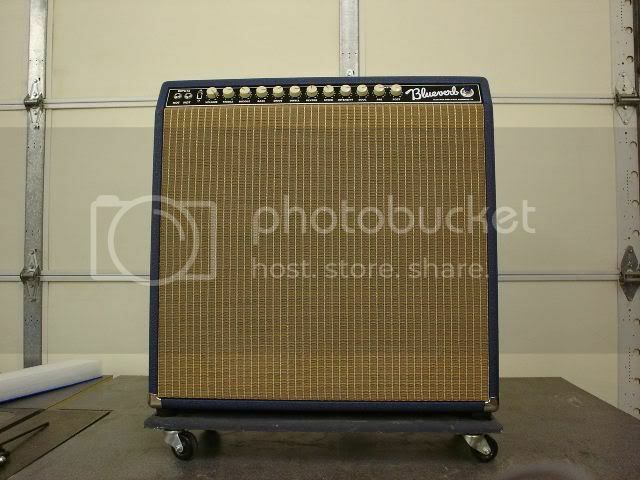 Blackface Fender lovers like me will surely drive the prices up on this great amp soon. Get in line with Smitty; it's worth the wait. 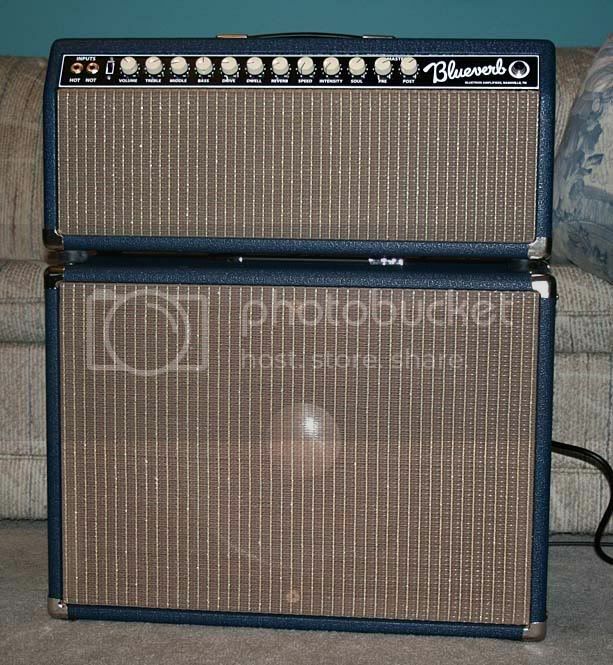 Here's BV #29 --- originally purchased as a 25W 2x10 combo, I've been having fun trying different tubes and speakers. Right now it's a 50W head running JAN Philips 7581A tubes (and a host of NOS preamp tubes) with a 5U4GB rect. to 'soften the hit' a little bit (a bit more sag). Currently switching speaker setups between the 1x15 JBL E130 in the pic or 2x10 EVM 10Ms --- both sound great! The JBL has a deep rich tone with crystal clear highs, while the EVMs have more midrange punch (but still a lot of low end thump for only 2x10s) --- both are REALLY loud if you want, hehehe. A great sounding amp, and Smitty's a real pleasure to deal with! I met smitty at a jam in Hermitage TN and played his Blueverb there several times. Absolutley killer amp, and a super nice guy to boot! About to get some NOS for mine. Should take it over the top. That is one nice looking amp! Do you have any clips? I just purchased a Sony recorder and have been using it to record our lunch time practice sessions. 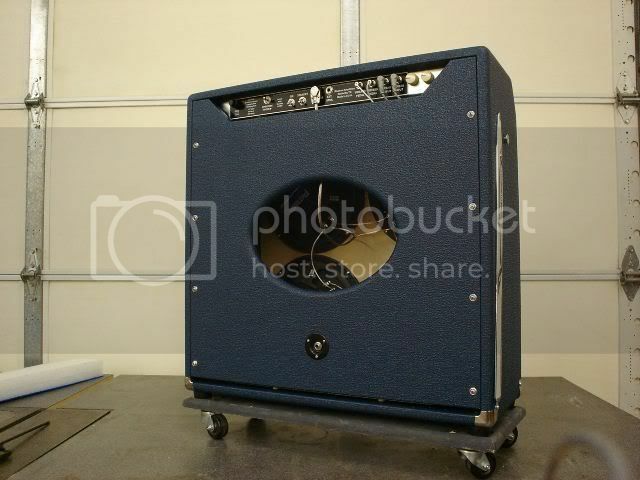 The amp I am using is my Blueverb 25 watt 1x12 combo. Please keep in mind that we aren't professional musicians and everything you hear is recorded with the Sony PCM-50 with the placement somewhat in between the bass player and my amp, with the exception of the one clip of me jamming to the Dr Rhythm drum machine. I am also using the Barber Direct Drive. I think that the tone I am getting from the amp speaks for itself. I am very happy with the amp. Here is the link to Sony's website for posting recordings. If you want to get a better playback try selecting the artist radio button. I committed to one yesterday. I'm pretty pumped up about it. I've been on Smitty's list since late August, really looking forward to this amp. Since you asked, here are a few of my bad boy, BV # 57. 4x10 (Ragun Cajuns & Copperheads), running 6V6's - gonna try EL34's one day soon. 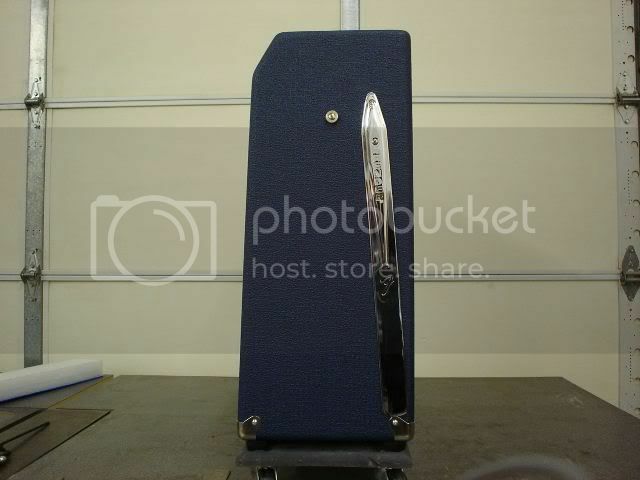 Bassman transformer, standard voicing, tilt legs and ported back. Weighs about what my wife did ten years ago. Uh, oh. I think she heard that. Here it comes!